The consumer retail sector is one of the leading industries with groundbreaking usage of digital strategies within spaces. Within the retail landscape, Nike can be an example of a brand using digital strategies to success. The brand’s Berlin flagship store, features customizable digital enhancements, including mobile apps, media walls and digital kiosks, but it’s more than deploying digital technology. What makes this Nike store innovative is how Nike applies these digital technologies in a novel, enhanced way to meet customer expectations and create highly personalized experiences. Within the Nike store, media walls are used to house lifestyle and community content, such as ticker updates, weather and social media posts. Nike has a multi-touch and multi-user display which enables user friendly interactions. Instead of using the digital wall simply as a messaging portal, the company transformed signage into an interactive experience, incorporating user-generated content like selfies and fan favorites for customers to push to their personal devices with a customized hash tag. Nike’s Bootroom transforms a standard touchscreen into a multi-touch surface that combines technologies like product videos, sport statistics, and comparable shoe data. RFID (Radio Frequency Identification) technology enables product detection paired with 3D-cameras that allow for a 3-way interaction between the digital surface, product, and user. What is the best way to stop customers in their tracks? Is it a dazzling sign, glamorous decorations, or an elaborate display? Or is it something even more attractive and eye catching, something that empowers customers to access product information and promotions with the touch of a finger? The answer is the next generation digital signage systems which feature interaction through user-friendly interface and allow customers to read messages as they like. Nike’s story is fascinating. The message of these new generation retail store displays is simple: at the touch of a finger customers can search for items they’re interested in-enjoyable and stress free. These displays bring consumer needs closer to the retailer, and helps to give the customers the incentive they need to make purchases. Data has shown that digital signage solutions has a measurable impact on audience retention and loyalty of approximately 30%, as well as boosted satisfaction by 46%. But like most technology, digital signage has undergone numerous evolutionary stages. The first variations focused on delivering critical information to consumers, while also enhancing company awareness and brand recall. Retailers were able to update their signs according to the time of day and location, and for a time, this was the norm of the technology. However, as competition rouse and new technologies emerged, new stages of evolution occurred; interactivity meant that digital signs evolved into kiosks which provided heightened levels of customer service. Armed with this technology, businesses were faced with a new type of interactive solution that engaged and enhanced the customer experience. Being able to transform a standard shopper into a loyal fan requires a sustainable and attractive experience that strengthens this type of relationship. Adopting multiple digital signage displays around a retail store works to improve the experience in multiple ways and can reduce customer frustration and boredom, display important information about product lines, discounts, and opportunities, and influence his shopping behavior. At the same time, digital signage displays also reduce the confusion by providing directions and assistance. 8 of 10 brands gained additional 33% sales through the use of digital signage. Empowering consumers in these ways helps in engage them and earning their trust – if they believe the retailer respects them, studies have shown that they will honor that relationship by spending more money and sharing their appreciation with their peers. Endless Aisle Kiosks: These are ideal for retailers who want to show more products than their premises square footage allows. Endless aisle kiosks permit customers to browse inventory options that aren’t available on the shop floor. Digital Menu Boards: Menu boards provide the opportunity to highlight certain products. Whether they are used to supply services or food, this can be a dynamic selling tool. Welcome Boards: The first impression that a customer receives when they enter a store is critical, and a dynamic board that highlights the brand and message can heighten the relationship with consumers. Remote Expert Access: Numerous specialty retailers struggle with providing product experts on the sales floor at all times, meaning that consumers might not receive the service they want (or expect). An “ask an expert”  kiosk could provide video-chat opportunities for those in need of extra assistance. Infotainment: Whenever shoppers are waiting for customer service, there is an opportunity to advertise, market, and influence. Reducing the perceived wait time by offering some form of entertainment can enhance the customer experience. A press release issued by Oracle highlights that 81% of shoppers will pay more for a better customer experience, meaning that even if a retailer charges premium prices, customers will continue to shop at that store if they are given the right experience. Not only are consumers willing to pay more, but 44% will pay a premium of more than 5% if it ensures a better experience. Retailers are finding that customer experience is just as important as product selection and price. The influence digital signage has on the customer experience and loyalty not only affects the bottom line, but also contributes to a positive ROI that retailers cannot afford to overlook. Thus retailers should focus on new and innovative ways of retaining customers through digital signage. Internet of things has changed the retail landscape when it comes to the customer experience. With the variety of information available to retail employees, they not only need it to be analyzed, but need to put it into action. The number of endpoint solutions available to retailers combined with the IoT can help retailers make more informed decisions to tailor the customer experience, and the strongest customer-facing tool in a retailer’s arsenal is digital signage, given it can be tailored in real-time to maximize profits. According to International Data Corp., the use of digital signage in retail outlets will grow from $6 billion in 2013 to $27.5 billion in 2018 for a 35.7 percent five-year compound annual growth rate, showing the importance brand outlets place on digital signage and their interactive capabilities. While there are a number of options to tailor the customer experience with the use of digital signage once prospective shoppers are in the store, another challenge is getting them in the store. According to Industry Weapon, 76 percent of consumers have entered a site because the sign was interesting, while an additional 75 percent of consumers have told friends about a store simply because they were impressed by the signage. 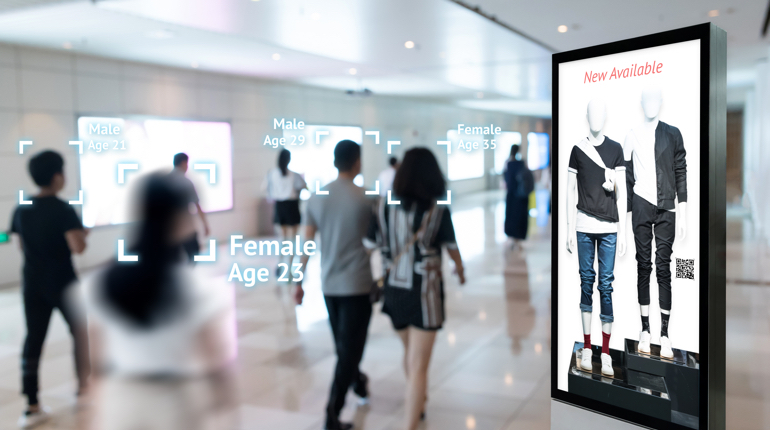 Some of the technologies that interact with digital signage through the IoT to deliver the tailored customer experience expected include integrated camera and beacon technologies. With its deployment, digital signage can tailor offers to a particular customer based on past purchases and preferences. It is predicted that digital signage will be a $20 billion industry by 2020. The usage of digital signage is growing at a pace of 20% annually. Acquisition Costs: The average cost for a single sign on a 100-sign network is now estimated at just over $3,500, a 58 percent drop in less than ten years. Simpler Content Management: Any business can take advantage of off-the- shelf tools like Microsoft PowerPoint or Paint. Content management systems, can be leveraged to address the needs of small businesses. Flexible Form factors.You can get a screen in any size today; they are all thinner and lighter. Media players are also shrinking. In the future, digital signage will have to interact with all types of other products, and as the digital signage industry continues to grow, the single screen with text, images and movie content will start to become “old hat,” and the new era of communication will be between the new products, digital signage, mobile and wearable tech together with the physical environment. The world we live in will become a global network of computers, data, sensors, cameras, databases, devices and virtual artifacts all communicating to impact our daily lives. Retailers are in a prime position to embrace this rise in technology and to develop our industry further to provide truly unique and groundbreaking solutions. Digital Entrants are Disrupting Retail: How Can Retailers Stay Ahead of the Game ? Can High Street Retailers compete with E-Retailers? Data Analytics may just be the key!